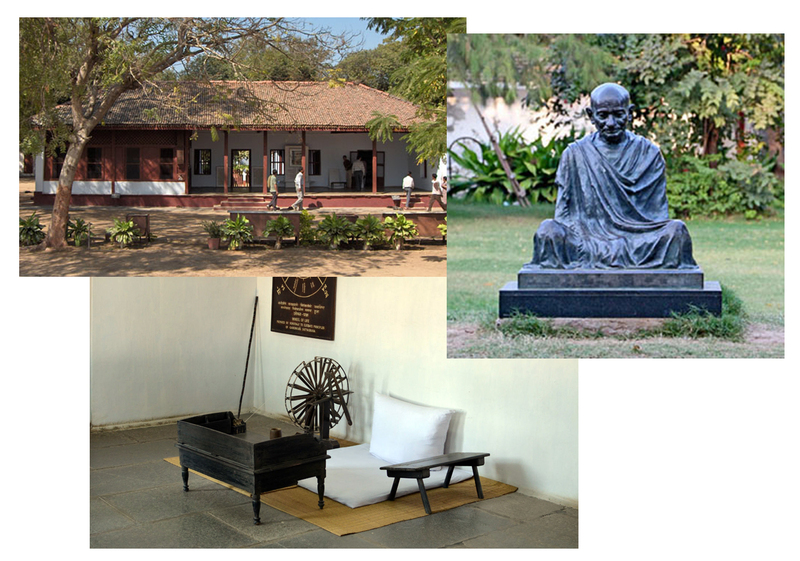 Serenity pervades the places associated with Mahatma Gandhi whether they be at Phoenix (Settlement) Ashram at Durban, South Africa, the Gandhi Ashram at Sabarmati, Ahmedabad, or the Rajghat Memorial, Delhi. Despite the hordes, the Mahatma seems to compel so much respect that even noisy tourists tend to unconsciously maintain a semblance of discipline. Our guide at Sabarmati Ashram led us to the Gandhi Smarak Sangrahalay housed in the iconic building designed by Charles Correa. The museum inaugurated by Jawaharlal Nehru, has three spacious galleries - Gandhi in Ahmedabad, My Life Is My Message, and Painting Gallery. There is a library and archives here too. The museum houses thousands of items - rare personal effects, original letters and photocopies of his other letters, photos of Gandhi alone and with world leaders, and paintings of luminaries. Natural light and a cool breeze flow with ease through the corridors and rooms built to be as seamless as possible. As we took a winding trail to Magan Niwas where Gandhi's nephew and ashram manager Maganlal Gandhi lived, the guide filled us in on some ashram history. After his return from South Africa and plunging full-time into the Freedom Movement, the Mahatma established his first ashram in 1915 in the Kochrab area of Ahmedabad - the two-storey building still stands. Later, in 1917, the ashram was shifted to its present location on the banks of the river Sabarmati. It came to be known as Satyagraha Ashram and Harijan Ashram. He lived here till 1930 when he set out to begin the epochal Salt Satyagraha or Dandi March from here. We hurried to Hriday Kunj, the big draw for us. This was Gandhiji's home where he lived with wife Kasturba from 1918 to 1930. This was also where he received national and international leaders. There were several rooms including the secretariat, kitchen, store room and an open space. Here too were personal memorabilia. 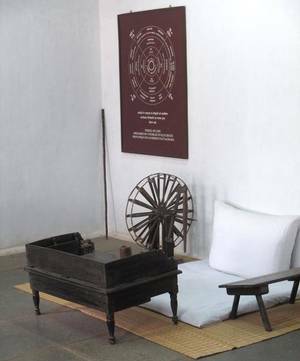 We peered through a window into the main room with the charkha or spinning wheel Gandhi used and his writing desks. We waited as another group of visitors prostrated before the large picture of Gandhi in the veranda, and a bunch of students took selfies with the Mahatma and then took our photographs standing alongside this picture. There were a few other cottages strewn around the grounds - where Gandhi's associates had lived and worked. There are buildings such as Vinoba-Mira Kutir named after Bhoodan Movement leader Acharya Vinoba Bhave and Madeleine Slade whom Gandhi rechristened Mira. Both were devoted followers of the Mahatma and lived here several years. There is Nandini, the guest house for visiting leaders; Udyog Mandir, founded in 1918 and which stood as a symbol of the dignity of labour and self-reliance; Prarthana Bhoomi aka Upasana Mandir; and Somnath Chhatralaya, the community living area. Minimalism is the key word in the ashram. Sparsely furnished rooms, simple architecture and uncluttered public spaces define the place - naturally. It is in keeping with Gandhi's core philosophy of simple living and high thinking. Another remarkable feature is cleanliness - the ashram is immaculately maintained except for a few of the rest-rooms. With the tranquil Sabarmati river flowing gently alongside, we walked over the soft, loamy soil of the grounds dotted with trees. I chose to pause at a large shade-spreading tree to feed the squirrels and birds with the grains and nuts I generally carry for such opportunities - and no Indian city provides them as much as Ahmedabad. A few others joined me while some wandered off to the Museum Shop for souvenirs and the rest went down to the river bank to watch and photograph the sunset over the Sabarmati. The ashram is at Gandhi Smarak Sangrahalaya, Ahmedabad, Gujarat. For details, call 91-79-2755 7277 or visit https://www.gandhiashramsabarmati.org/en/. Being a famous landmark in the city, it is well-connected by local buses and every autorickshaw and cab driver knows the place. There is no entry fee. Free guided tours are arranged for schoolchildren if the ashram is informed in advance. The entire ashram is a no-smoking zone. The ashram is open between 8.30 am and 6.30 pm throughout the year including Sundays and holidays. The Museum Shop sells books on and by Gandhi, keychains, wall-hangings, statues, khadi handkerchiefs, crystal and stationery. The best buys are miniature charkhas, all priced reasonably. There are some pushcarts and makeshift shops outside the entrance which sell small charkhas, three-monkey sets and Gandhi photos.